A multimeter is a device that can be either digital or analog and has the ability to measure voltage, continuity and resistance. By placing the leads on either side of the circuit, readings indicate if and how much current is flowing through that circuit. When testing an appliance such as a washer or dryer using a multimeter, you are testing the circuits in the unit. 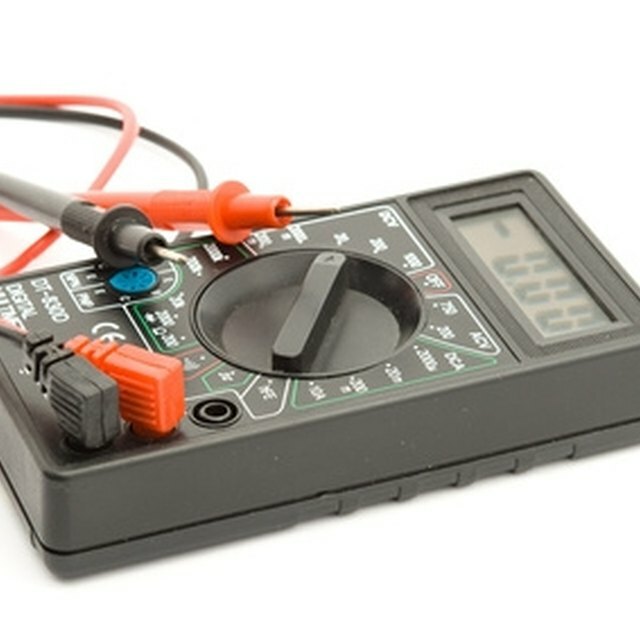 For these types of tests, set your multimeter to its lowest ohm setting. Ohms are indicated by the Greek symbol for Omega. Locate blown circuits in your washer or dryer using a multimeter. Familiarize yourself with your multimeter. There are different types available, and reading the manual provided with yours aids you in using it correctly and getting accurate readings. Attach the red and black leads to the multimeter. Match the colors, if available, or attach the black lead to the neutral port and the red lead to the positive port. Unplug the washer and dryer. Not only is a power source dangerous to you, but it can also interfere with your readings, giving false readings by allowing the current to bypass the circuit you're testing. Access the circuits in the units. In washing machines, circuits that can be tested are the lid switch, the water level switch, the water temperature switch and the water inlet valve. Use the owner's manual for your washer to locate these components. In dryers, locate and test the terminals visible on the heating unit and thermostat. Choose the circuit to test, and test by placing one lead on each terminal. Terminals appear as metal prongs extending off the circuit. When testing a circuit for resistance, look for a zero reading. Resistance, or a reading higher than zero, means the circuit is open and not conducting electricity the way it is supposed to. A closed circuit, reading at zero, is working properly. Before dismantling a washer or dryer that isn't working, test the power cord. Unplug it from the wall, and test the two prongs on the plug. Little or no change in the meter reading may indicate a faulty cord. You may also test the outlet in the wall by carefully inserting the leads into the holes to be certain the outlet is functioning by delivering voltage. Only touch the insulated parts of the leads to avoid dangerous electrical shock.